Stratford J14’s and J15’s Kings of the Day! Stratford upon Avon Boat Club were invited for the first time to join Royal Grammar School Worcester and Worcester Rowing Club as guests of Kings School Worcester at their annual indoor rowing competition. First up was the WJ14 individual four minute event. 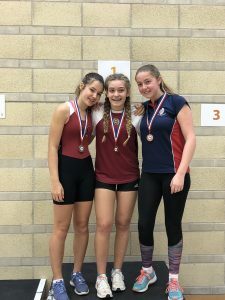 Freya Watts, Lucy Browne, Fleur Griffiths and Anne Mynors all competed in this event. Griffiths set out hard and led for over two minutes, when a very strong girl from Kings pushed on past. In the last minute Watts, having maintained a steady pace throughout managed to finish in the Silver medal position having made it to 988 metre. Browne taking the Bronze from Griffiths in the very last stroke of the race with a distance of 968m. Griffiths finished up fourth having completed 965m and Mynors finished in a very respectable eighth place out of fifteen competitors with 910m. 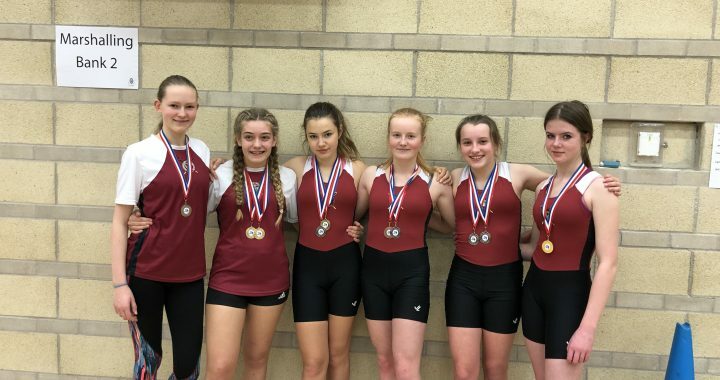 The individual timed events continued with the WJ15 five minute race that saw Emma Harrison, Martha Usselmann and Sophie Elstone racing side by side. The bank of claret tops saw a determined start by Elstone that put her in a commanding position with Usselmann and Harrison following her lead. Elstone settled nicely during the middle of the race with Usselmann constantly jostling between third and fourth place with Harrison closing. The final minute of determined pushing to the finish saw Elstone finish in Gold position a clear 80m ahead of her closest rival with Usselmann and Harrison both gaining fresh personal bests in a close fourth, and seventh positions respectively from a field of thirteen competitors. Representing the Stratford Boat Club participation group was Charlotte Johnson competing in the WJ16 individual six minute event. 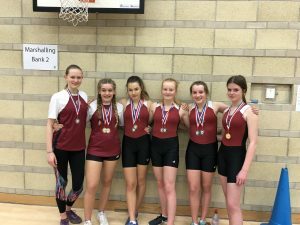 Charlotte was up against a field including five rowers from the hosts – Kings School. 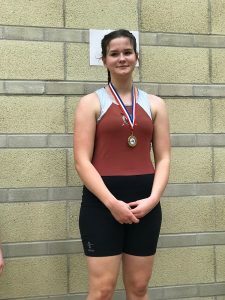 Despite limited preparation leading up to the event, Charlotte finished in fifth position with a personal best of 1400 metres – missing out on a podium finish by a mere 38 metres. Then was the turn of Bella Chappelhow and Honour Keil in the WJ14 individual 500m event. 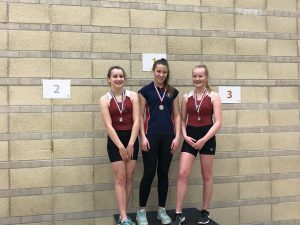 This was strongly contested between the two Stratford girls, with the three Kings girls making up the other three places. 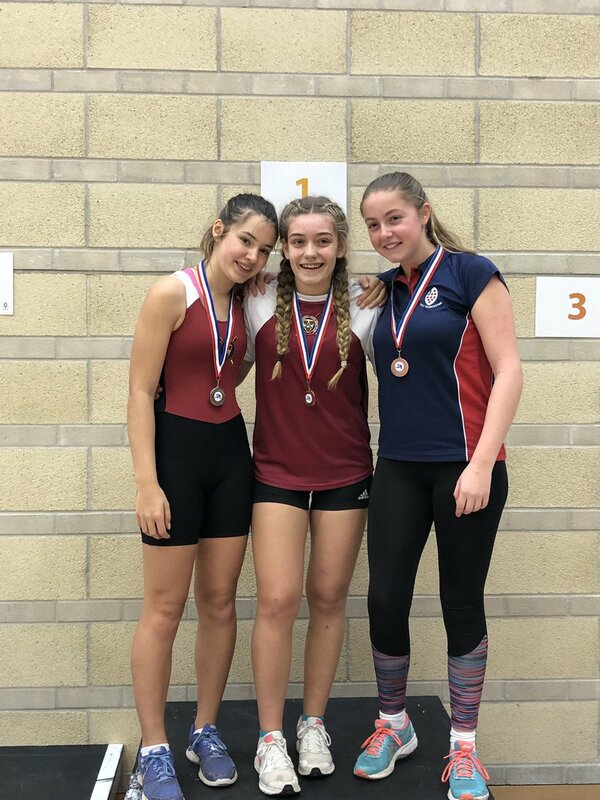 Both girls had an extremely good row with Chappelhow taking the Gold medal in a time of 1:48.9 with Keil just 0.8 of a second behind taking the Silver. The bronze medal was won in a time 10 seconds slower than Keil. Harriet Hodgson took the flag for the J15s in the Y10 500m event. A fast and furious race from the off with tough competition from the hosts saw Hodgson at her finest. Maintaining a strong position throughout, the final pushes saw her finishing in a time of 1:48 ensuring a place on the podium in Silver medal position. Then it was the time for the relay races. First up were the WJ14 relays raced over 2000m. Chappelhow, Keil and Griffiths teamed up to form one relay team with Mynors, Watts and Browne teaming up to make the other. Both teams raced hard with some fantastic quick changeovers. 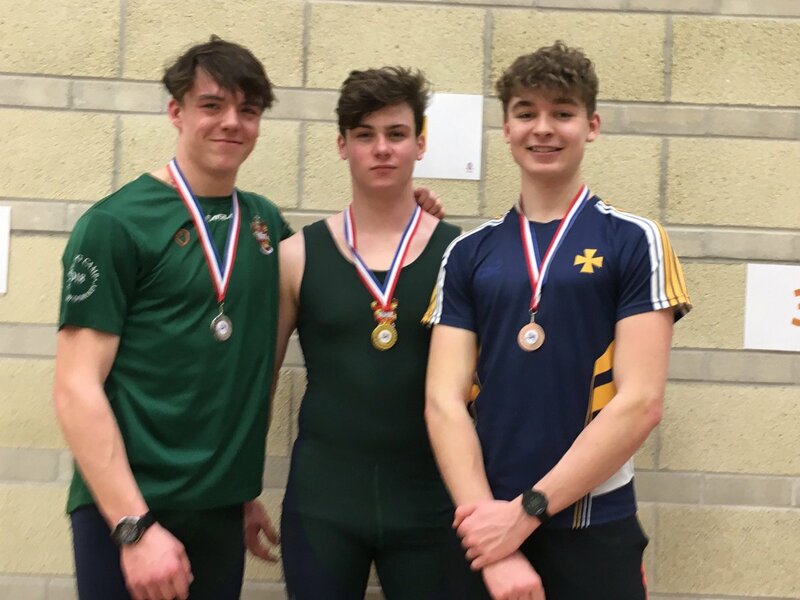 It was Chappelhow, Keil and Griffiths that managed to pick up the Gold medals on this occasion in a time of 7:30.1 with Mynors, Watts and Browne fighting it out with another strong team from Kings beating them by just 0.3 of a second to take the Silver medal in a time of 7:44.2. 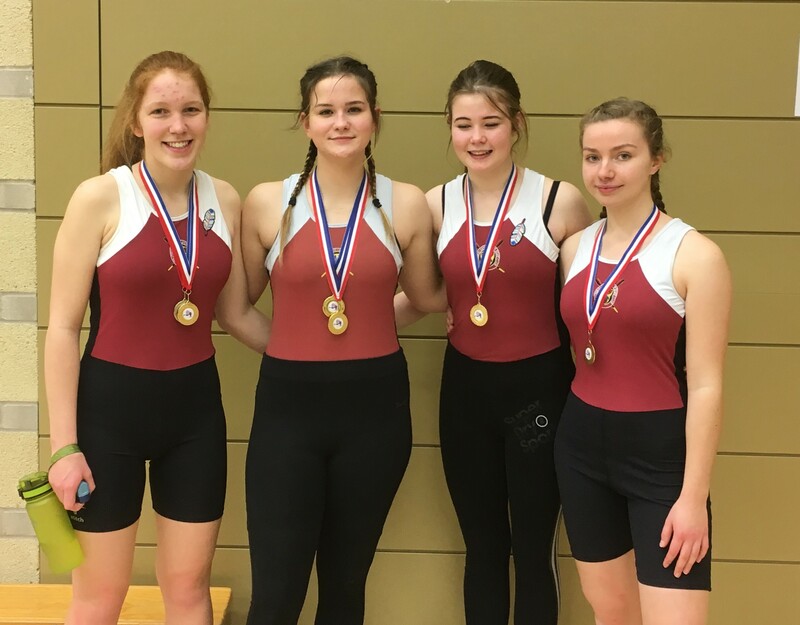 The WJ15 2km relay brought together Elstone, Harrison, Hodgson and Usselmann for their final race of the day. Establishing a 30m lead after the first few changeovers proved that their practicing had paid off, as they seamlessly held their position over the opposition. 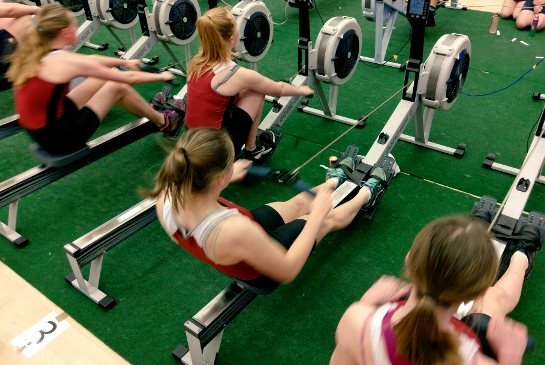 Maintaining their lead, the girls finished in Gold medal position in a time of 7:12.6.